This short video contains all the details you need to know about Kaladesh plus décor and activity ideas that will help you create memorable experiences for your players. Your Kaladesh kits are scheduled to arrive over the course of this week. Use the thopters and airships found within to help turn your store into the bustling plane of Kaladesh. Consider hanging bright blue strings of lights, streamers, or cloths on your walls and ceilings to represent the Aether (naturally occurring energy) that flows freely throughout the sky. Update and promote your event calendars in your store, on your social media channels, and on your website. 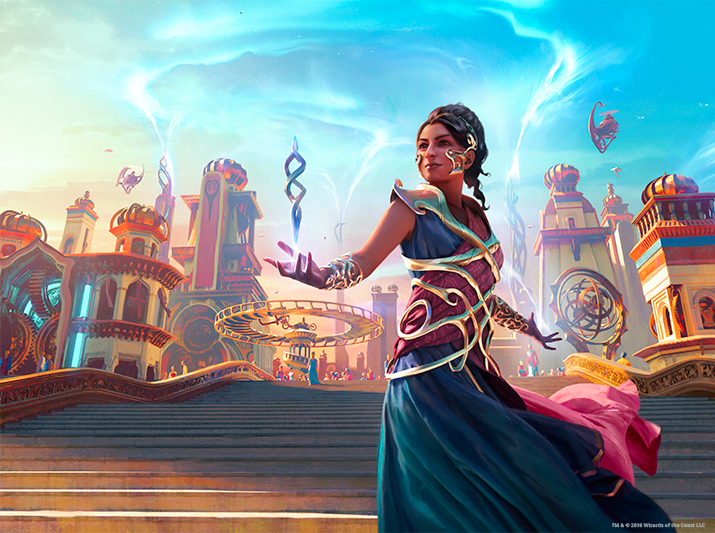 Use the Kaladesh themed headers, product shots, and web banners found on the WPN marketing materials page. If you’ve installed the Facebook tab, you’ll have access to two exclusive preview cards from Kaladesh. Beginning now, direct players to check out your Facebook tab for a chance to vote on what card they’ll get to preview. We’ll reveal the cards on 9/7 & 9/9 and follow up with fresh content later on. Use the previews as an opportunity to remind players to preregister for your Prerelease. Just click this link, select your store's page, then choose "Add Page Tab." Navigate back to your store's page, and click "Manage Tabs." Slide the tab up to the top. This tab only works with a business Facebook page. It cannot be used on a personal Facebook page or on a website. If you've already installed the tab, you don't need to do anything to get access to the new content. Encourage players to preregister to your events using the Kaladesh event invitations found under “Flyers and Posters” on the marketing materials page. Start handing them out at your events and point of sale area. In the spirit of Kaladesh, we are challenging you to invent your store’s tomorrow! Take your store to the next level by innovating your space, event experience, services, or any other aspect of your business. If you need help coming up with ways to innovate your store, look to your player community for suggestions on what they would like to see evolve. Involving your community gives players an amount of ownership and emotional investment in the success of your business. Share what you have planned with us here for a chance to be featured on the WPN and Magic websites and our official social media channels! Now start preparing your store to host amazing experiences that will inspire players to come back for more fun!